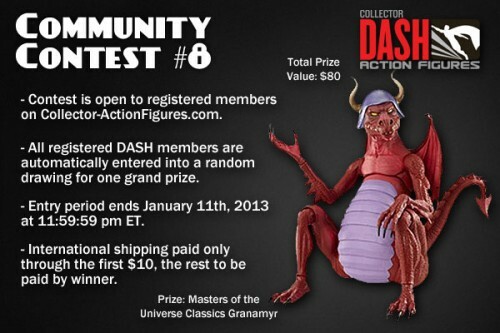 Win a Masters of the Universe Granamyr from DASH! Granamyr is one of the wisest characters in all of Masters of the Universe lore, and we’re giving you the chance to demonstrate how wise you are by registering on Collector-ActionFigures.com today. You’ll get one of the best action figure experiences online, prove you’re one of the wisest collectors around by making the most of your figures on DASH, and you’ll automatically be entered to win a Masters of the Universe Classics Granamyr in the process. If you’re wondering why a digital collection on DASH is a wise choice, you should consider the following benefits. The ability to track your collection on the DASH Catalog by seeing how many figures you have, how much you paid for them, and when you bought them. The ability to purchase new and vintage figures, sell your own to a targeted audience, and browse for unique deals on the DASH Marketplace. Access to full collection reporting, trading with other members, and extensive figure values in the DASH Collector’s Club. Those are just a few of the reasons signing up for a new membership on DASH will help you with your collection, and the best way to experience all the reasons is swing by the site right now and start playing around. You have the power to make your collection great! For complete contest rules and requirements, please email corey@Collector-ActionFigures.com.